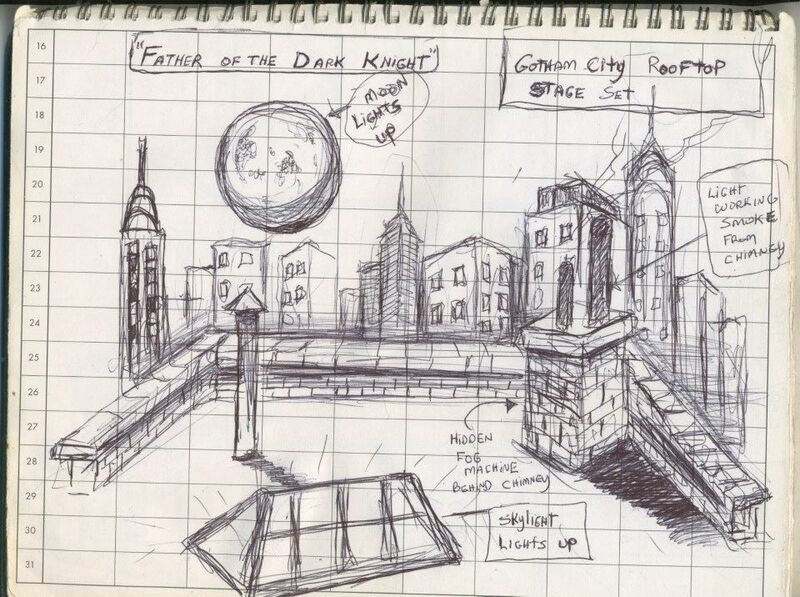 ORIGINAL CONCEPT SKETCH by Roberto Williams: Very early rough concept layout for Gotham City Rooftop stage set. Mr. Williams did this fast sketch in his student attendance row book, during a lunchtime conversation with drama students. This was meant to explain potential stage scene-blocking for the rooftop action sequences. This sketch was created in December of 2011, in the weeks immediately following Mr. Williams' decision to write, produce, and direct "Fathers Of The Dark Knight". As the site of The Batman's first appearance in "Fathers Of The Dark Knight", the eerie Gotham City Rooftop "stage set A" is an impressive example of set construction. The full moon and Gotham night skyline are represented as High-Definition backdrop projections behind a detailed modular set that features an impressive water tower flat as the set's dramatic centerpiece. Some of the rooftop's modular pieces each feature automatic functions, with atmospheric smoke provided by the steam vent components! 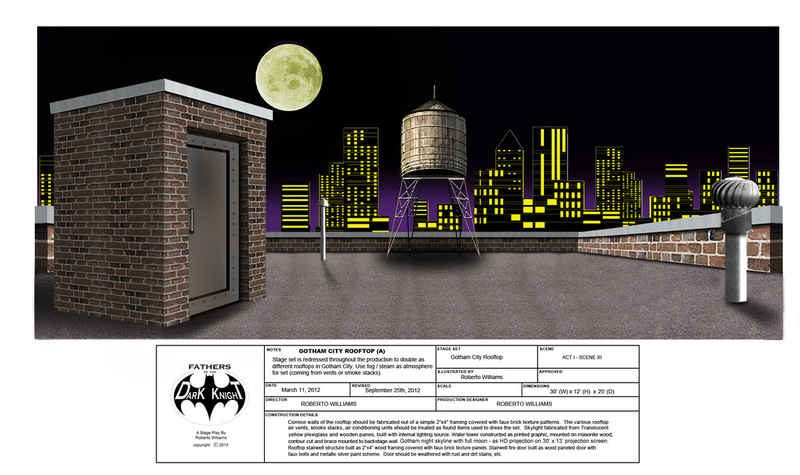 Gotham City Rooftop "stage set B", features a light-up skylight, along with the other working modular set pieces. This location serves as the site of THE BATMAN'S fateful first encounter with the felonious female cat-burglar CATWOMAN!